A 27 year-old female is brought in by ambulance with syncope. Pre-hospital providers report that the patient developed pelvic pain, vaginal bleeding and lost consciousness. On their arrival, her blood pressure was 80mmHg systolic, point-of-care glucose was normal – a peripheral IV was started, fluids were administered and the patient was transported to the emergency department. On arrival, vital signs were notable for tachycardia and hypotension. The patient was lethargic, maintaining arousal only with constant verbal or noxious stimulation. Her abdomen was markedly tender throughout with rebound and involuntary guarding. Her last menstrual period was 5 weeks ago and she suspected that she was pregnant. Peripheral venous access was expanded and uncrossmatched blood products were rapidly transfused. Whole blood on a point-of-care pregnancy test was positive1, and a bedside FAST demonstrated free intraperitoneal fluid in the hepatorenal recess with large free pelvic fluid. Gynecology was consulted for emergent operative management of suspected ruptured ectopic pregnancy with hemorrhagic shock and the patient was taken to the operating room. The evaluation of suspected ectopic pregnancy, as with all complaints in the emergency department, begins with an assessment of patient stability: airway, breathing and circulation. The unstable patient requires immediate interventions to secure each critical component, all temporizing measures until the patient can be taken to the operating room for definitive management. 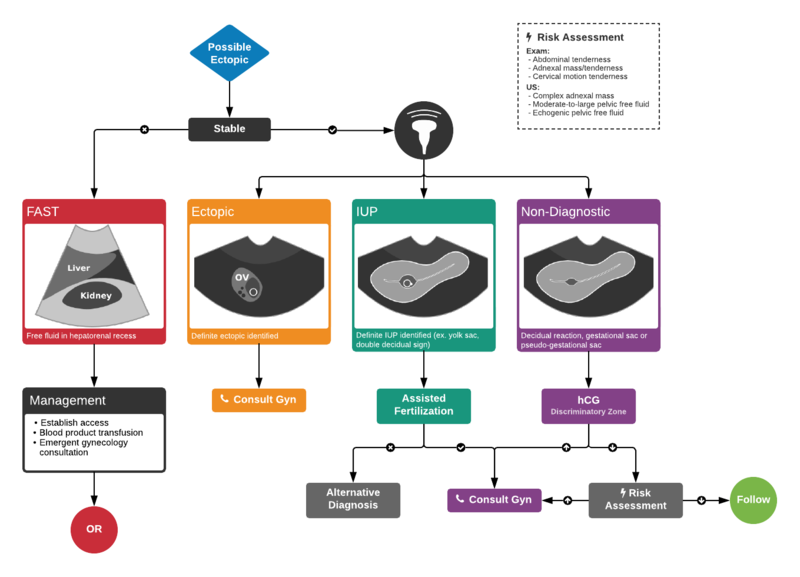 The evaluation and management algorithm for stable patients is dependent on findings of transabdominal & transvaginal ultrasonography, quantitative hCG level (relative to the institution-dependent discriminatory zone), and the identification of high risk historical and examination features that would prompt specialist consultation despite otherwise benign diagnostic tests. If ultrasonography demonstrates a definite ectopic pregnancy (extrauterine live embryo, adnexal mass containing yolk sac), gynecology consultation is warranted – the table below details candidates for attempts at pharmacologic therapy. If an intrauterine pregnancy is identified such as a live embryo or yolk sac, barring the presence of risk factors for heterotopic pregnancy (namely, the use of assisted fertilization methods 2, 4-6), then an alternative cause for the patient’s symptoms should be sought. If the ultrasound is non-diagnostic, patients should be stratified according to risk based on historical features, examination findings and quantitative hCG. If the hCG is above the institutional discriminatory zone, the absence of a definitive IUP is concerning, elevating suspicion for a non-visualized ectopic and warrants gynecology consultation. If the hCG is below the discriminatory zone, then certain features such as the presence of abdominal, adnexal or cervical motion tenderness, or high-risk ultrasonographic features including greater-than-moderate free pelvic fluid, complex fluid, or complex adnexal masses may be secondary features of ectopic pregnancy – again warranting consultation. If no high-risk features are present, close follow-up with repeat hCG and ultrasonography is reasonable. Fromm C, Likourezos A, Haines L, Khan ANGA, Williams J, Berezow J. Substituting whole blood for urine in a bedside pregnancy test. J Emerg Med. 2012;43(3):478-482. doi:10.1016/j.jemermed.2011.05.028. Bhatt S, Ghazale H, Dogra VS. Sonographic Evaluation of Ectopic Pregnancy. Radiol Clin North Am. 2007;45(3):549-560. doi:10.1016/j.rcl.2007.04.009. Lin EP, Bhatt S, Dogra VS. Diagnostic Clues to Ectopic Pregnancy. Radiographics. 2008;28(6):1661-1671. doi:10.1148/rg.286085506. Winder S, Reid S, Condous G. Ultrasound diagnosis of ectopic pregnancy. Australas J Ultrasound Med. 2011;14(2):29-33. doi:10.1002/j.2205-0140.2011.tb00192.x. Crochet JR, Bastian LA, Chireau MV. Does this woman have an ectopic pregnancy? : the rational clinical examination systematic review. JAMA. 2013;309(16):1722-1729. doi:10.1001/jama.2013.3914. Mol BW, van Der Veen F, Bossuyt PM. Implementation of probabilistic decision rules improves the predictive values of algorithms in the diagnostic management of ectopic pregnancy. Hum Reprod. 1999;14(11):2855-2862. First-Trimester Emergencies: A Practical Approach To Abdominal Pain And Vaginal Bleeding In Early Pregnancy. October 2003:1-20. Paspulati RM, Bhatt S, Nour S. Sonographic evaluation of first-trimester bleeding. Radiol Clin North Am. 2004;42(2):297-314. doi:10.1016/j.rcl.2004.01.005. Anderson FWJ, Hogan JG, Ansbacher R. Sudden Death: Ectopic Pregnancy Mortality. Obstet Gynecol. 2004;103(6):1218-1223. doi:10.1097/01.AOG.0000127595.54974.0c. Lozeau A-M, Potter B. Diagnosis and management of ectopic pregnancy. Am Fam Physician. 2005;72(9):1707-1714. Stone MB. Emergency Ultrasound Diagnosis of Ruptured Ectopic Pregnancy. Academic Emergency Medicine. 2009;16(12):1378-1378. doi:10.1111/j.1553-2712.2009.00538.x. Stein JC, Wang R, Adler N, et al. Emergency Physician Ultrasonography for Evaluating Patients at Risk for Ectopic Pregnancy: A Meta-Analysis. Ann Emerg Med. 2010;56(6):674-683. doi:10.1016/j.annemergmed.2010.06.563. Alkatout I, Honemeyer U, Strauss A, et al. Clinical diagnosis and treatment of ectopic pregnancy. Obstet Gynecol Surv. 2013;68(8):571-581. doi:10.1097/OGX.0b013e31829cdbeb. Arleo EK, DeFilippis EM. Cornual, interstitial, and angular pregnancies: clarifying the terms and a review of the literature. Clinical Imaging. 2014;38(6):763-770. doi:10.1016/j.clinimag.2014.04.002. Rodgers SK, Chang C, DeBardeleben JT, Horrow MM. Normal and Abnormal US Findings in Early First-Trimester Pregnancy: Review of the Society of Radiologists in Ultrasound 2012 Consensus Panel Recommendations. Radiographics. 2015;35(7):2135-2148. doi:10.1148/rg.2015150092. Diagnosis and Management of Ectopic Pregnancy: Green-top Guideline No. 21. BJOG. 2016;123(13):e15-e55. doi:10.1111/1471-0528.14189. Hahn SA, Promes SB, Brown MD, et al. Clinical Policy: Critical Issues in the Initial Evaluation and Management of Patients Presenting to the Emergency Department in Early Pregnancy. Ann Emerg Med. 2017;69(2):241–250.e20. doi:10.1016/j.annemergmed.2016.11.002. Lee R, Dupuis C, Chen B, Smith A, Kim YH. Diagnosing ectopic pregnancy in the emergency setting. Ultrasonography. 2018;37(1):78-87. doi:10.14366/usg.17044.